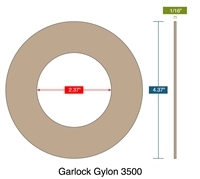 Garlock Gylon 3510 ismade in a unique manufacturing process that minimizes cold flow problems associated with typical skived and expanded PTFE sheet. Its unique construction, which includes premium PTFE resin and barium sulfate fillers provides excellent bolt load retention. Garlock Gylon 3510 is suited for strong caustics, moderate acids, chlorine, gases, water, steam, hydrocarbons, and cryogenics. It also conforms to FDA regulations.